Two iconic Newcastle organisations have entered into an industry-first partnership, dedicated to building the financial literacy of the region’s communities. The lab will enable Newcastle Business School students to build their skills in financial decision-making, risk management and economic systems, before they graduate. The partnership will reach beyond and benefit more than just University students. The Greater Finance Academy, a financial literacy outreach program, will be delivered to high schools in the Hunter, Central Coast and Western and Northern NSW regions, as well as the Greater Finance Clinic, will support and provide a financial literacy outreach program for the broader community, to be held at NeW Space. Hosted by the University and Greater Bank staff, the short courses will provide the latest data on how community attitudes to money are changing and share information on financial topics that people of all ages need to consider when managing their money, including simple strategies on saving, reducing debt and how to avoid being scammed. 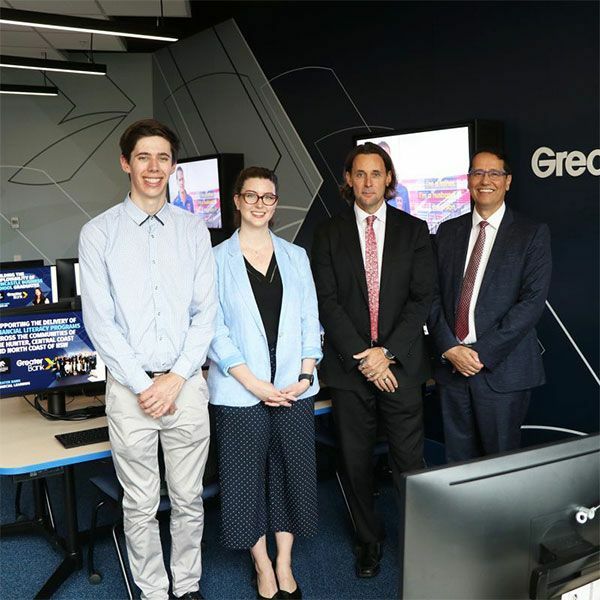 Pro Vice-Chancellor, Faculty of Business and Law, Professor Tony Travaglione said the partnership with Greater Bank would provide valuable and innovative opportunities to support University of Newcastle students and the Hunter community to build skills and improve their financial literacy. “The University of Newcastle is committed to providing our students with practical, industry-leading learning opportunities that provide a clear pathway into a career. Financial planning and investment labs have become crucial teaching and research facilities offered by the majority of accredited Business Schools across Australia, the USA, Asia and Europe,” Professor Travaglione said. “The lab will enable students, studying in the areas of finance, decision-making, business analytics and corporate governance, to hone their business and analysis skills in a simulated corporate environment using industry standard financial software. It will also be a practical learning centre for the wider community,” Professor Travaglione said. Greater Bank Chief Executive Officer, Mr Scott Morgan, said they were thrilled to be involved in this innovative venture, which demonstrated a commitment and mutual support of improving the lives of individuals and community connectedness through financial literacy. “This idea of collaboration and community support is the underlying premise of what makes this partnership with the University of Newcastle so important for our business,” Mr Morgan said. “It has provided us with the opportunity to join forces with a like-minded educational institution to provide members of the community, especially our next generation, with access to information that will help provide clarity and understanding around the intricate web of finance. This applies no matter where people choose to keep or invest their money. Professor Travaglione said the strong partnership between the University of Newcastle and the Greater Bank was set to make a positive impact on the Hunter, Central Coast and Northern NSW communities. “We look forward to working together to prepare our students for the real financial world and play a part in building the financial literacy of the region’s communities,” Professor Travaglione said.